The offset of the wheel is the distance (measured in millimeters) between the portion of the core of the wheel and the line in the center of the wheel. There are three kinds of offset: zero, positive or negative. The mounting portion of the wheel on the vehicle is inlined in the center of the wheel. The offset is positive when the center of the wheel is found in the front part of the wheel, in the half that is on the side of the road. This causes the majority of the wheel to be located towards the brakes and suspension components. Positive offsets are typically found on traction cars. 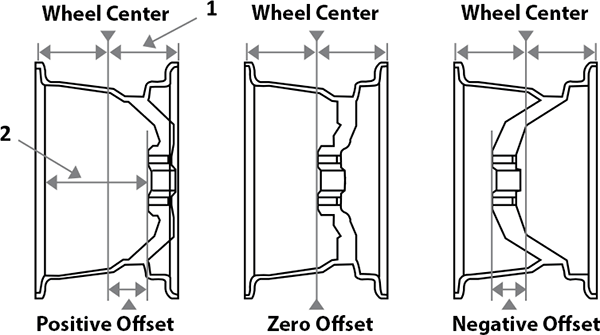 Unlike the positive offset, the negative will pull the mounting area in half behind the center line of the wheel, leaving more room for the components of suspension and brakes. Wheels that are considered 'concave' are on 'tuning' cars or on trucks with lifted suspension. Not having a suitable offset for your vehicle can directly affect the compatibility of a wheel with your vehicle, but also your driving, comfort, or even your mechanic. By changing the specifications of the wheel, like the width, it is important to adjust the offset so that the wheels are not too deported towards the fenders (commonly called aggressive wheels), or simply that the wheels give off enough to not interfere with brakes or suspension.